The Best Way To Experience The Duck Hunting Capital Of The World. Chad has the best property around and its absolutely loaded with birds. I highly recommend booking your next duck or goose hunt with these guys! Hunt Over 40,000 Acres Of The Most Incredible Waterfowl Property In The World. More Information About Us And The Property. We are the premier waterfowl outfitter here in Stuttgart, Arkansas also known as the duck hunting capital of the world. Known as the heart of the Mississippi flyway. Chad Lloyd is the owner and handles the day to day operations. We have been serving hunting enthusiasts for over 14 years now. We were born and raised here. We know this land like the backs or our hands which allows us to make every hunt an incredible experience for our customers. The grand prairie area is a large wintering area for millions of waterfowl of every species migrating here every year. This is the mecca for ducks and geese in Arkansas. We are between two major flyways; the Bayou Meto WMA and the White River National Wildlife Refuge. That being said, we are right in the middle of the largest flyway in the Stuttgart, Arkansas area. We currently have 28 duck blinds to choose from on an Arkansas guided duck hunt, or an Arkansas self guided duck hunt. 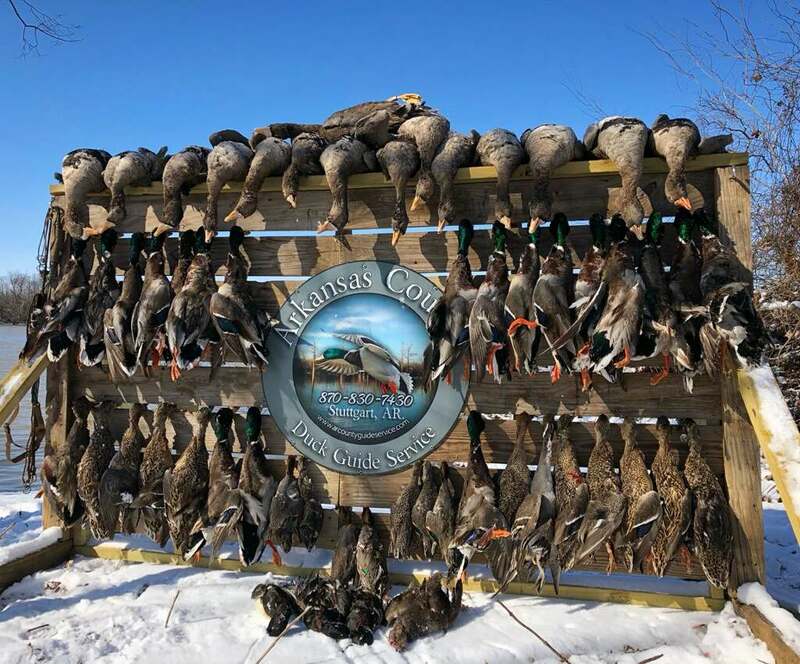 We have hand picked these areas over many years and now cover over 40,000 acres of prime duck and goose hunting property within minutes of Macks Praire Wings and 20 minutes from our lodges. We offer guided and self guided duck hunts in flooded timber, swamps, oxbowl lakes and flooded fields. We also offer guided snow goose and Specklebelly goose hunts in flooded and dry agricultural fields. At Arkansas County Guide Service we offer everything for your duck and goose hunting needs! Chad is the owner and operator of Arkansas County Guide Service. He was raised hunting ducks in the same areas where we hunt today in Stuttgart, Arkansas. As a kid he always tagged along on hunting trips with his grandfather. At the young age of fifteen he started helping his grandfather with clients at the hunting club, which is where he found his passion for waterfowl hunting. He runs a non stop four month waterfowl season and the off season is spent preparing for the next season. He follows waterfowl all over Arkansas each year to ensure that each of his hunters' expectations are met. Dylan is an avid outdoors-man and a dedicated duck and goose hunter since he was introduced to the outdoors and water-fowling at the early age of 5. He first learned to hunt wood ducks in the river swamps, and divers along the coast of the panhandle of Florida. He has since traveled to many states to experience and master a range of different hunting styles and situations. Dylan is a current 12th American Government and Economics teacher out of Holmes County Florida. Dylan started assisting as a guide with us in 2015 and will be back guiding in the 2018 season when he is not in the classroom. David started chasing waterfowl at 15 years old. He hunted ducks and geese in Oklahoma, Mississippi, Missouri, and in his home state of Tennessee. He started his guiding career in the Mississippi river bottoms in the backwaters to the world famous Lake Reelfoot where he guided for 5 years with outstanding results. David brings 15 years of waterfowl hunting experience to our team. I grew up an a family with a rich waterfowl hunting heritage as many would find surprising since I am from Nebraska. I remember my old man telling me stories of my great grandpa running market duck hunts and selling them in Kansas City for profit, or my dad and his buddies having to hold up limits of ducks at the hospital window because he had a heart attack in the goose pit. I have chased ducks and geese up and down the flyway from North Dakota down to Arkansas. I started duck hunting 15 years ago as a tag along. Since then I have made it a point to understand and know how to hunt ducks in every situation given from the dry corn fields of the north to the rice fields of the south. I promise to work as hard as possible to ensure you have a successful and enjoyable experience with Arkansas county guide service. Kate is an avid lover of the outdoors and dedicated duck hunter since 2015. She first learned to hunt wood ducks in the swamps of South Carolina and has since traveled to various states on her own to experience a range of different hunting environments. She has already checked 12 different species of duck off her list and has plans to travel for more. She is an Army veteran and a current full time Deputy Sheriff out of Greenville, South Carolina. Kate started assisting as a guide with us in 2017 and will be back guiding in the 2018 season. Ever since he killed his first mallard at the age of 8 years old, Gordon has been hooked on duck hunting. Gordon started guiding in 1995 in Louisiana and has been guiding in Arkansas for 6 years now, bringing 42 years of hunting experience to our team. He is also the owner of Bragging Rights Cut Down Calls. Ready to experience the hunt of a lifetime? Checkout the different guided hunts that we offer! In December of 2017 my cousin and I took one of the duck hunting trips we have always wanted - to Stuttgart, Arkansas. We had purchased a hunt at a local Ducks Unlimited banquet to hunt with Arkansas County Guide Service. Since we had never done anything like this, there were a lot of questions that we had. Owner Chad Lloyd was extremely helpful in getting our hunt all set up. There we a couple conflicts that came up, but Chad did everything possible to make sure we were set-up with what we wanted and even a bit beyond. Our hunting experience lived up to everything we had hoped for. We hunted 2 days in a buckbrush pond and one day over a flooded rice field - both set ups were first class. The guides Chad set us up with were very personable and knowledgeable. Our guide for the first two days really stood out to us, he was a lot of fun to hunt with, and could he blow a call. His personality made for a great time in the blind. Sure we shot ducks, plenty to make two Iowa boys who don't get a lot of shooting back home very happy, but it was just the full experience Chad and his group gave us that stood out. We have already booked our December 2018 hunt with Chad and look forward to many more hunts in the future with Arkansas County Guide Service. Traditional duck hunting, that’s what you’ll find at Arkansas County Guide Service. Flooded rice fields, dry fields, reservoirs or buck brush in the creek. They have what the birds want. I’ve hunted around this area for years and when I ran into this outfit, I stopped looking. Chad and his guides have gone above and beyond to make my hunts successful. I hunt with them two to three times a year and I will tell you, Chad is a people person. He is easy to talk to and express needs or concerns. He has never made me or my groups feel like it’s about the money. He wants you to shoot ducks. He and his guides know the area well and scout daily to put you on birds. The guides are polite, courteous, and well mannered gentlemen. They also run the best dogs and call like champions. I’m pretty sure a couple of them compete. I feel after hunting around, I get more than I pay for with them. What I’m saying is, I stay at a nice lodge, have good hunts, never feel mislead or misguided and they treat you like buddies. Bottom line is you can pay more somewhere else, but I promise, You can’t get better service. We were referred to Chad with Arkansas county guide service and have hunted with them since 2016. Chad and the guides are very personable, professional and likes killing ducks and geese just as much as we do. The lodge and its amenities are great and hanging out at the duck camp with other groups and the guides are half the fun. Chad has multiple leases and offers a variety of hunting options including fields, swamp, timber. His blinds are exceptional and the time and work he and the guides put in scouting really shows. The pictures speak for themselves. We look forward to going back every year!